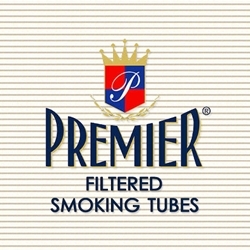 The Premier name is one of the best known brands of filtered tubes used today. Manufactured by CTC - Clinton Tube Company of Plattsburg, New York, this brown-tipped filtered tube is very well made, providing consistency with mild flavors though out every draw. Premier Filtered Tube are offered in king-size or 100mm and looks every bit as nice as any manufactured brand. Use Premier filtered tubes and save money over the high cost of retail stores brands. Start tubing with Premier Filtered Tubes today! At Smokers Discounts we’ve made it easy and affordable to buy tobacco products online. Call us for more details!